I’ve been saving this for a rainy day. For when the clag’s down. And the wind is whipping up the snowflakes. 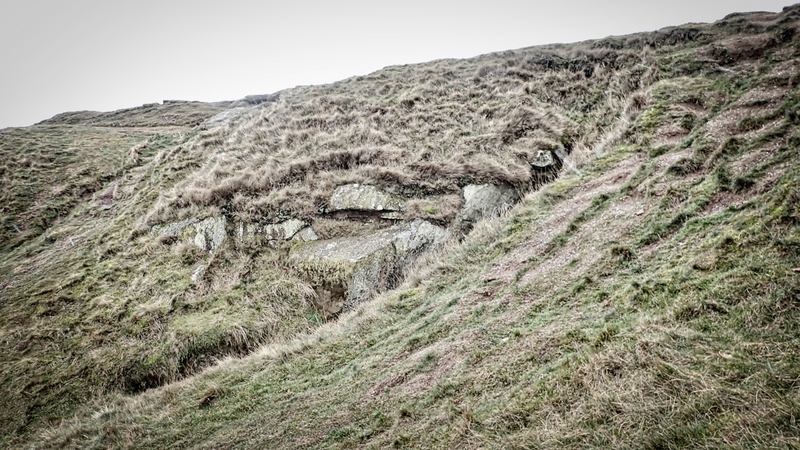 This small damp gash in the hillside is likely to be the Roseberry Well where a young prince was said to have drowned. Nowadays no water flows from the spring and the crevice acts as a sump for plastic bottles and modern detritus. But the story goes that long ago the young Prince Oswy was the cherished son of Oswald, King of Northumbria. His mother dreamt that her baby son would drown on a certain day. The Queen was so distraught that, on the fateful day, she climbed the highest hill in all the kingdom so that the prince would be safe, far away from any water. At the time the Kingdom of Northumbria extended to all land ‘north of the Humber’. But so tired out by the climb was the Queen, that she fell asleep while Prince Oswy played in the sunshine. But what the Queen had not realised was that there was, in fact, a spring near the summit known as the Roseberry Well. A spring which was reputed to have medicinal properties, it was said to soothe sore eyes. But you can guess what happened, for while the Queen dozed, the prince fell in the small pool and was drowned. The story goes on that the Queen was so heartbroken that she too died soon afterwards. She was buried alongside her son in a place further south along the Cleveland Hills. A place which came to be known as ‘Oswy-by-his-mother-lay’ or Osmotherley. Who would have thought such an enchanting tale could be woven from an inconspicuous piece of hillside. Many thanks, thoroughly enjoyed.